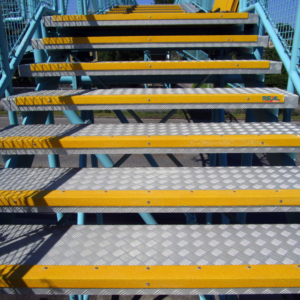 Unfortunately, we see that there are still many accidents on stairs, and we know that a large proportion of those could have been avoided with an anti-slip solution. 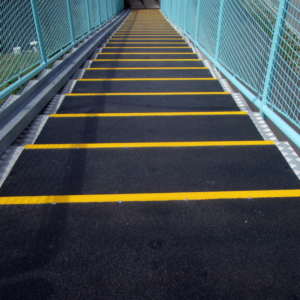 We have delivered anti-slip solutions since 2005, which have, of course, prevented a number of fall and slip accidents. 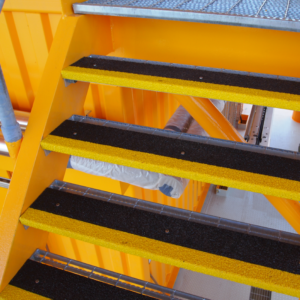 Many of our solutions have been delivered to the offshore industry, to the metal, food and process industries and shipping industry, but we have also provided effective anti-slip solutions for the private and public sectors. Our anti-slip step covers are designed and manufactured to suit existing steps. The products are made of high quality glassfibre, wherein silicon stone has been embedded. The silicon stones ensure maximum friction and unrivaled lifetime for the products. We produce anti-slip step covers in many different colors and sizes, and we are very flexible in terms of production. If you have any special wishes, we can surely fulfill them, so do not hesitate to contact us, even if you are looking for a slightly atypical anti-slip solution. Do you want text on your stairs? We have the opportunity to produce anti-slip step covers with text or pictograms on them. This gives you the opportunity to secure your stairs while also increasing attention to the potential danger of tripping on the stairs. 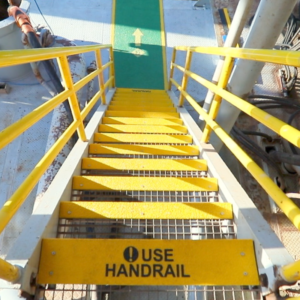 Many people use the text: 'Use handrail' which is a good way to reduce the risk of serious accidents. Whether you are a business owner or private person, we are sure that you will do whatever you can to prevent someone from getting into a falling accident. A very large proportion of falls occurs on stairs, and therefore it is a great idea to slip-proof stairs, both at work and at home. We have anti-slip step cover profiles for all types of stairs, so we can without a doubt help you to prevent falling accidents on the stairs in your home or at your workplace. If you have questions of one kind or another regarding anti-slip step safety, we will gladly answer them. We can be reached by phone and by mail. Our phone number is +45 26 11 44 66, and our mail is realsap@realsap.com.